Fig. 1. Strategy of gastroesophageal reflux disease (GERD) treatment. (A) Conventional strategy of GERD treatment (an abridged edition of the Evidence-based Clinical Practice Guidelines for GERD 2015 published by the Japanese Society of Gastroenterology). Initial treatment is administration of proton pump inhibitor (PPI) standard dose for 8 weeks. Then, maintenance treatment is administration of PPI half dose daily. If incomplete healing occurs, maintenance with continuous PPI standard dose is permissible. On-demand PPI treatment is alternative management strategy. (B) The authors propose a new strategy of GERD treatment considering the effectiveness of potassium-competitive acid blocker (P-CAB). Initial treatment is 4-week treatment with P-CAB standard dose for severe erosive esophagitis. 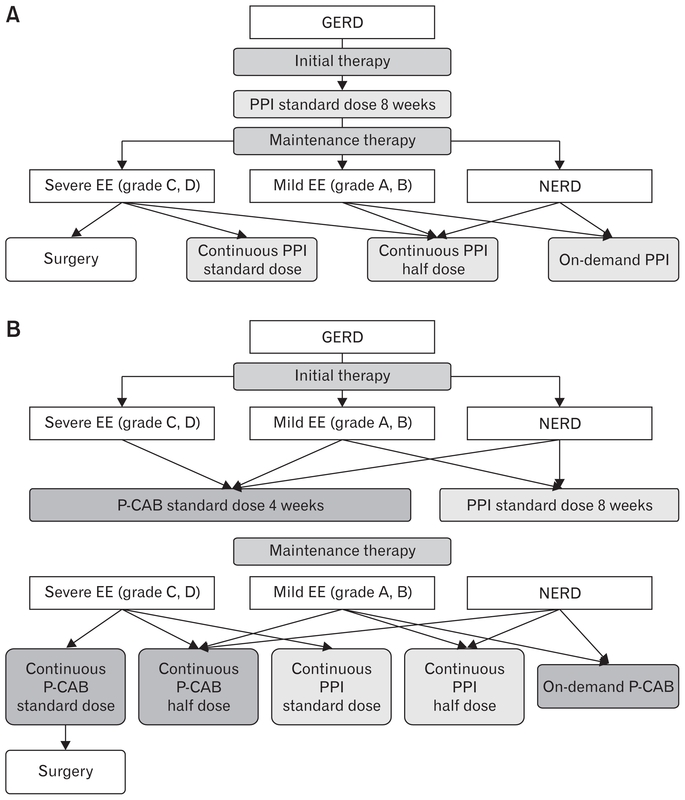 Four-week treatment with P-CAB or 8-week treatment with PPI are recommended as an initial therapy for mild erosive esophagitis or non-erosive reflux disease (NERD). Then, maintenance treatment is administration of P-CAB half dose daily. If incomplete healing, maintenance with continuous P-CAB standard dose is permissible. Continuous PPI standard or half dose daily is one of the options. On-demand P-CAB treatment is a workable alternative management strategy. The severity of reflux esophagitis is classified according to the Los Angeles classification. EE, erosive esophagitis.